Sponsored by the Lancashire Wildlife Trust and Forestry Commission in the United Kingdom, the competition for a new Visitor’s Center for the Brockholes Nature Reserve near Preston in Lancashire set a series of ambitious goals, among them being the creation of a nature conservation site of regional, national and international importance. The restoration of the project site and adjacent land is part of Britain’s largest land regeneration program ever. The project site is composed of 261 acres of land on which an operating gravel quarry currently sits. The site is surrounded by 163 acres of additional woodlands and is bounded on the south and east by the River Ribble, on the north by the Boilton Woods and on the west by the M6 Motorway. Preston has a somewhat cold and wet climate typical of the northwest UK. Although the chance of occurrence is generally small, the site is prone to flooding. The need to address the flooding issue coupled with the client’s desire to site the building and associated facilities in the general area of the existing quarry facilities led us to select a prominent ridge as the ideal perch for the structure. As we began to investigate various programmatic relationships within the context of our immediate site it conjured up some qualities that initiated a formal investigation of particular interest which was appropriate given the nature of the project. The investigation involved the abstraction of the structural concept of a tree (branching, rootedness, etc.) and the ensuing occupation of that structure. 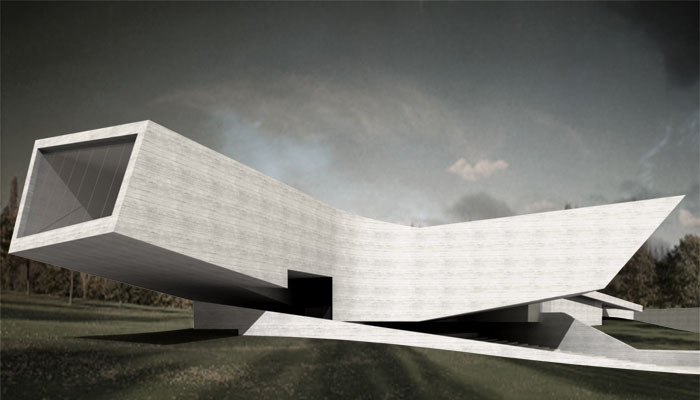 The building emerges from the landscape to the east, lifting up in all directions while still rooted in the site. 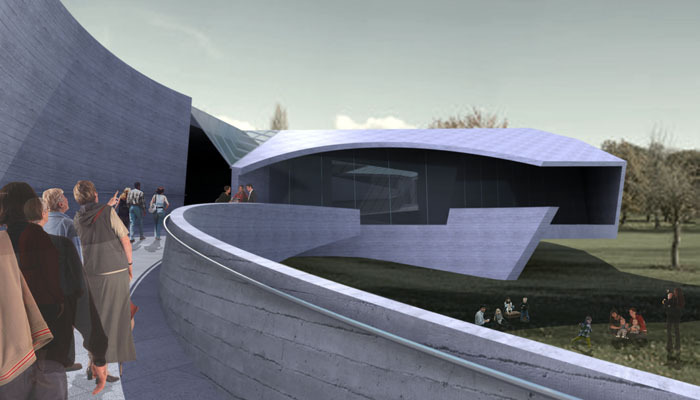 It is the more public programs that are freed from the ground plane and elevated while the back of the house functions remain physically connected to the landscape. 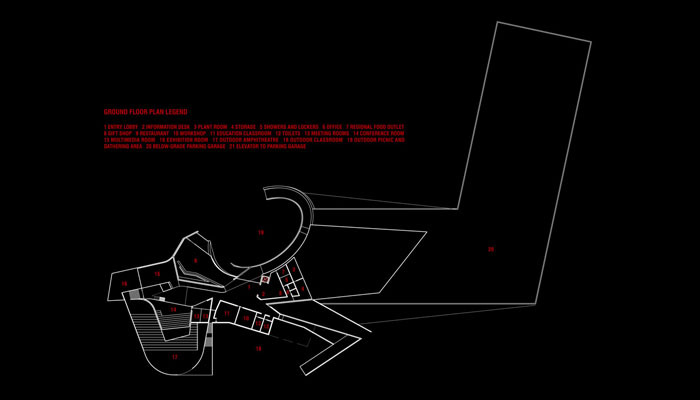 The result of this process is a project that exhibits an interlocking of built form and landscape with programmatic branches as an extension of their interaction. Additionally, a parking garage is located below a green roof that meshes seamlessly with the landscape. The vehicular loop which encloses a temporary bus and recreational vehicle staging area, processes vehicles through to the parking garage or allows drop-off at the main entry. 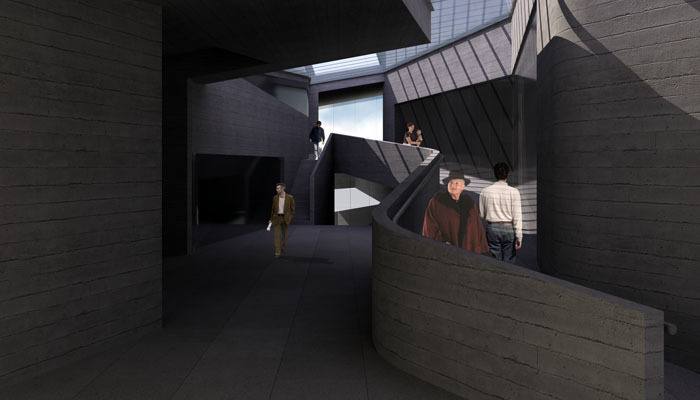 From the main entry, visitors ascend the elliptical entry ramp and simultaneously overlook the outdoor gathering space nestled within. The restaurant looks out on this gathering space and the typically animated entry ramp and finally back towards the River Ribble. 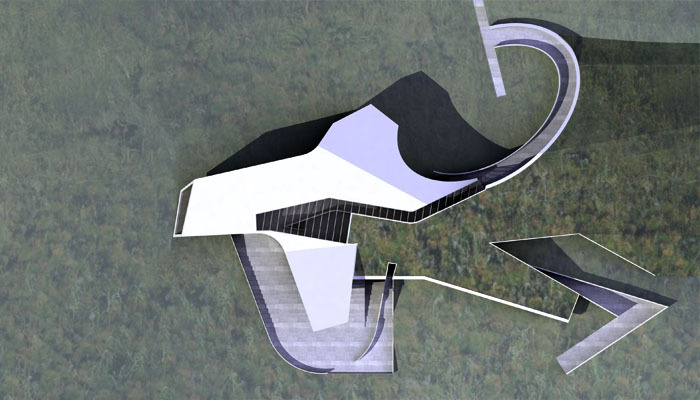 It is this exterior ramp that begins a strong idea of trajectory and circulation through the project. 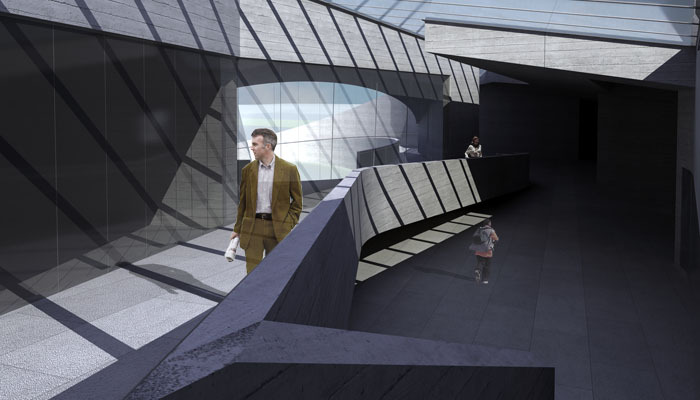 At the lobby space, the interior circulation loop moves up towards the gallery and media space. 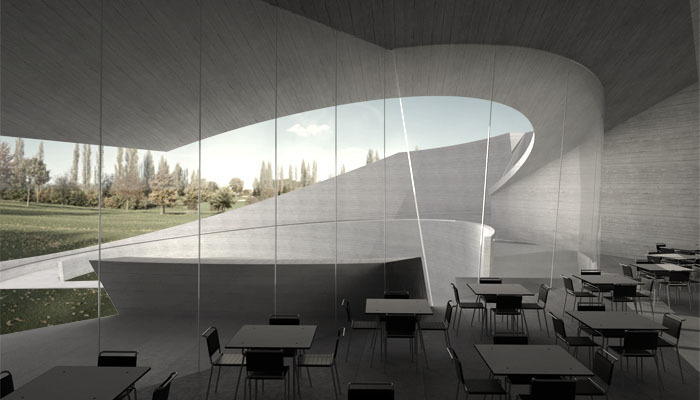 There was an emphasis on providing several focused views to the landscape from within this internal space maintaining a visual connection with the site. There is a continuity of the exterior to interior movement systems identifiable in the circulation diagrams. We proposed a specific sequence of experiences through a primary loop that is complemented with secondary movement systems. 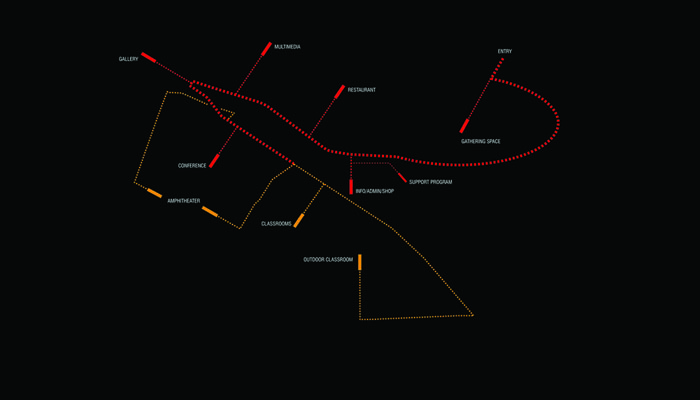 Depicted in the diagrams here, the red dashed lines here represent the primary circulation loop and the orange lines are representative of the secondary movement paths. 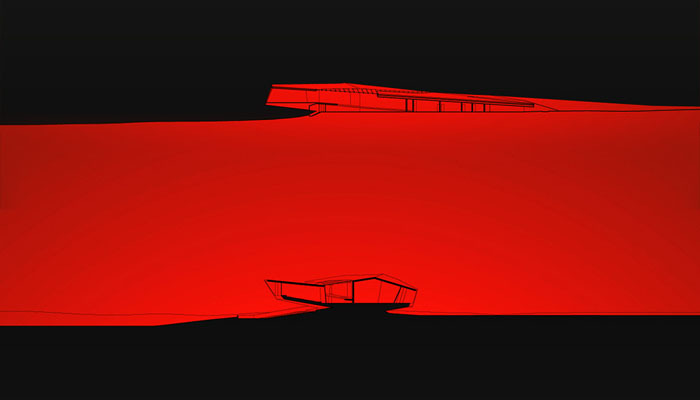 The internal ramp defines the northern edge of the central public space. The most public program locates itself along the main internal circulation ramp; restaurant, media room, gallery and conference. There are two points of access to the amphitheatre provided and two methods of access to the outdoor classroom, both which eventually lead down to the nearby water’s edge.